SINGAPORE, 6 OCTOBER 2018: Albirex Niigata FC (S) added another trophy to their haul this season after beating Brunei DPMM FC 4-1 in the RHB Singapore Cup final at Jalan Besar Stadium earlier this evening. Albirex captain Wataru Murofushi led the way with a brace that sandwiched Adam Swandi’s strike, before Hiroyoshi Kamata added a fourth. Azwan Ali Rahman netted a late consolation goal for DPMM, who fell short in their bid to win the Cup for the first time. The White Swans are the first team to win the Singapore Cup four times in a row, having first won it in 2015. 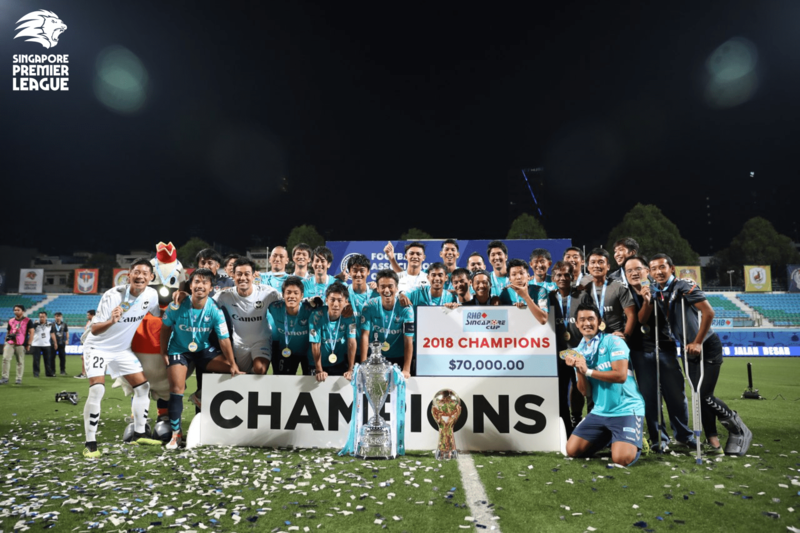 They have also made a clean sweep of trophies for the third year running, having been crowned Great Eastern-Hyundai Singapore Premier League champions last month on top of defending the Great Eastern Community Shield earlier this year. Football Association of Singapore (FAS) Advisor, Associate Professor Ho Peng Kee, presented the medals to Albirex Niigata FC (S), while RHB Singapore Head, Strategic Corporate Communications, Ms Elaine Sng and FAS President, Mr Lim Kia Tong handed the trophy to the winners. The team also received their cash prize of $70,000. First runners-up Brunei DPMM FC were also presented with medals and a cash prize of $45,000. Earlier in the day, Balestier Khalsa FC claimed the second runners-up spot after winning 5-4 on penalties over Home United FC. The match ended in a 2-2 draw at full time. FAS Council members Rizal Rasudin presented the Tigers with their medals and cash prize of $25,000 after the match. Balestier Khalsa FC won 5-4 on penalties.